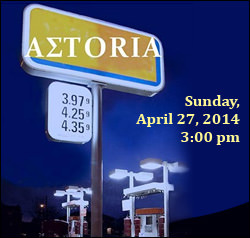 Presentation by Nicos Alexiou of his bilingual collection of poetry about the Greek-American community of Astoria. Commentary by Aristotle Michopoulos. Although the Astoria section of New York has been considered the largest Hellenic settlement outside of Greece or Cyprus, it is striking that it has received relatively little attention by writers, artists, and social scientists. The present bilingual book of poems and images, both as a physical object and as a discursive project, is about a culturally neglected enclave in the midst of ethnic and social transformations. Even in the era of globalization, every social and artistic action occurs somewhere locally, and accordingly the poems and images presented here emphasize the role of exile, of people, and of place. Nicos Alexiou teaches in the Department of Sociology and the Center for Byzantine and Modern Greek Studies at Queens College, and he recently received the President’s Award for Excellence in Teaching. His fields of interest are social theory and research, ethnic studies, and issues concerning the Greek-American community. He is the founder and director of the Hellenic American Oral History Archive. He is the author of five books of poetry, and his work has been published in various English and Greek journals and anthologies.